Chinese New Year festival 2013 in Chinatown Bangkok. 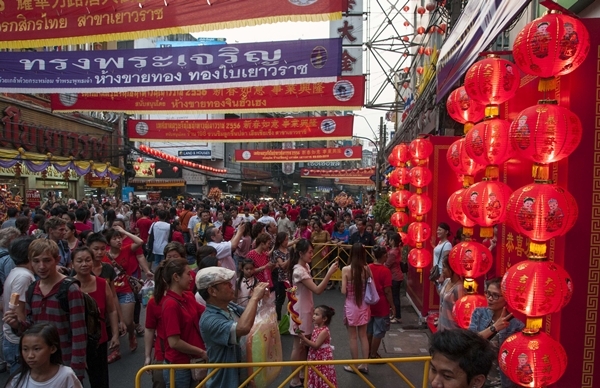 Bangkok’s Chinatown is known among Thai people as “เยาวราช Yaowarat”. It has been the main center for trading by the Chinese community for more than 200 years. There are many small streets and alleys full of shops and street vendors selling all types of goods – Chinese herbs, clothes, gold etc. Yaowarat comes alive each evening after dusk, and it is one of the most exciting dining destinations in Bangkok. My Top 5 favorite stalls in Yaowarat are: 1) ก๋วยเตี๋ยวคั่วไก่ Kuay Teow Kua Gai (Fried noodles with Chicken) This dish is actually Chinese, it is similar to Thai’s Pad See Ew (ผัดซีอิ๊ว). The special method of this place unlike somewhere else is they cook chicken in brass pan on a pot-sized charcoal stove, and top the dish with crispy squid . 2) หอยแครงลวกป้าจิน Hoi Krang Luak Bpa Jin ( Aunt Jin’s Soft Boil Cockles ) They use fresh cockels and what makes it so good is Nam Jim or dipping sauce which is made of Sweet Peanuts Stick (น้ำจิ้มถั่วตัด). 3) ก๋วยจั๊บอ้วน โภชนา Kuay Jap Oun Pochana ( thick rice noodles soup) Kuay jap is Rice Noodle Rolls in broth. This longstanding Kuay Jap vendor is possibly the most popular hawker stall in Chinatown. 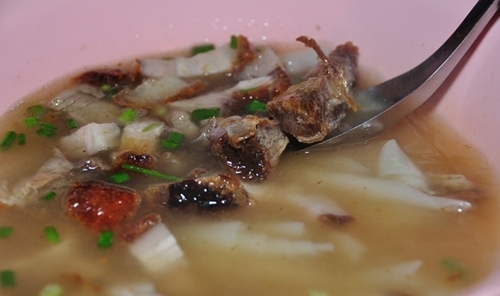 People have been known to cross town for the cook named Lek’s exceedingly peppery broth and tender offal, which includes pork heart, liver, stomach and tongue. Location: Corner of Soi 11 and Yaowarat Road. Tel: 02 224 3450. 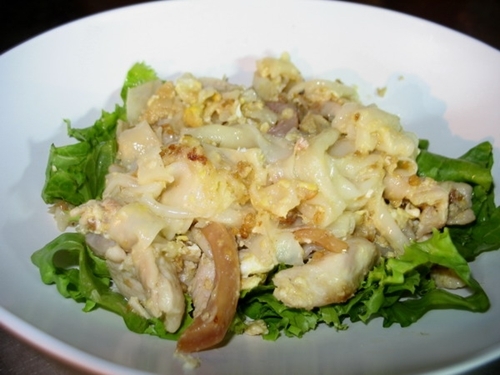 4) นายหมง หอยทอด Nai Mong Hoi Nang Rom Tord (The oyster omelette at Nai Mong) My mom often took me to oyster omelette place in my hometown when I was a little girl and I disliked this dish until I found Nai Mong Hoi Nang Rom Tord – a crisp and rich base of eggs topped with an unctuous sauce of oysters and spring onions. Sprinkle it with some white pepper and splash over the Sriracha chili sauce. Once you try it, you will understand why I changed my mind and this place has been going for 40 years. Tel: 02-623-1980. Open daily 11am-9pm. 60 Baht/dish. 5) ก๋วยเตี๋ยวหลอด Guaythiew Lod (Stuffed rice flat noodles rolls ) at Guaythiew Lod This Chinese-style delicacy is unabashedly delicious: stuffed to overflowing with pork, shiitake mushrooms, dried shrimp and squid, topped with bean sprouts, scallion and deep-fried garlic and bathed in a sweet soy sauce. Sounds good, right? It tastes even better than it sounds. Tel: +66 (0)2 225 3558. Open Tue-Sun 6:30 p.m.-1 a.m. 35 baht/bowl. 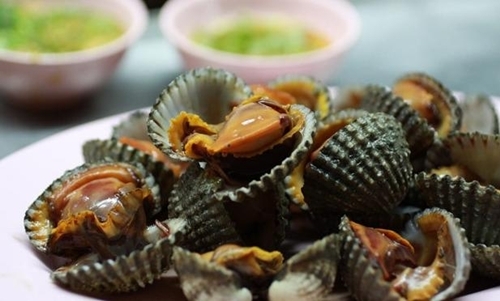 Last but not least, if you are a fan of Seafood you might want to stop at the popular Lek & Rut Seafood restaurant. 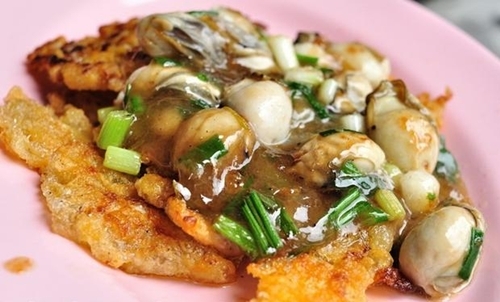 The restaurant is located right on the corner of the busy Yaowarat Road and Soi Phadung Dao. It’s hard to miss because you will see waiters in red shirts and a long queue on the street, and it is famous so everyone knows of it! 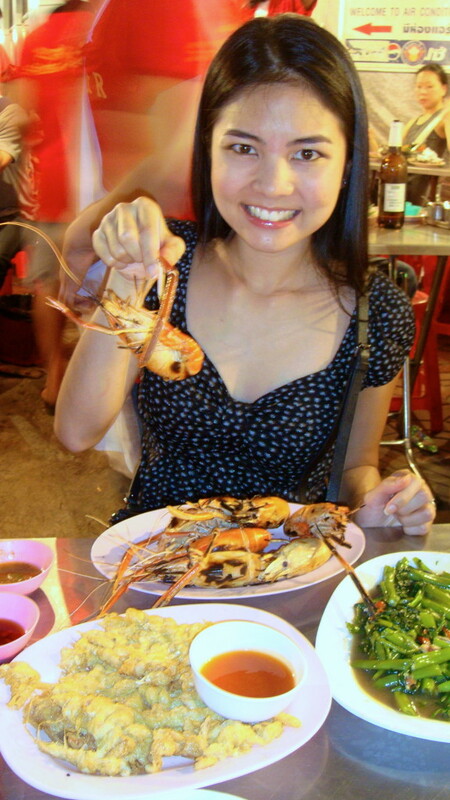 I went to eat at Lek & Rut Seafood many times. 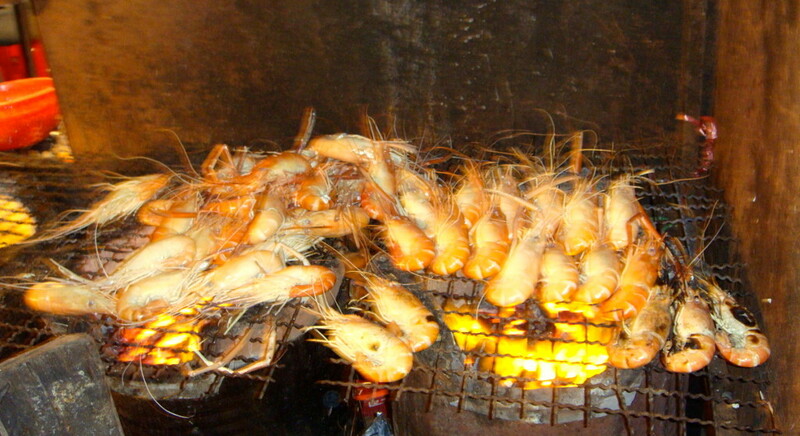 On the recent trip I ordered grilled prawns (กุ้งเผา Goong Pao) which was cooked perfectly. Not overcooked, very fresh and tasting of the grill. It was excellent with the green seafood dipping sauce; and crab omelette (Khai Jiao Puu ไข่เจียวปู) which Thai people like to eat with Chilli sauce. As well as stir fried morning glory with chilies (pad pak bung fai daeng ผัดผักบุ้งไฟแดง), my favourite vegetable dish. 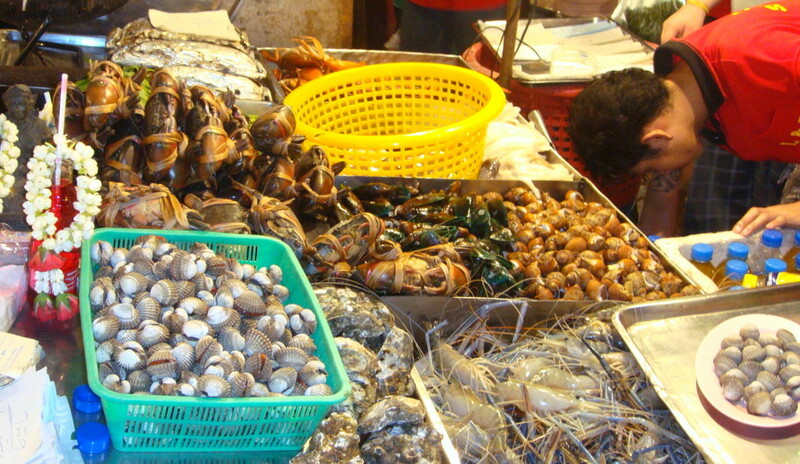 There is a selection of various seafood. Oh! and there is always room for dessert (This is my motto!). 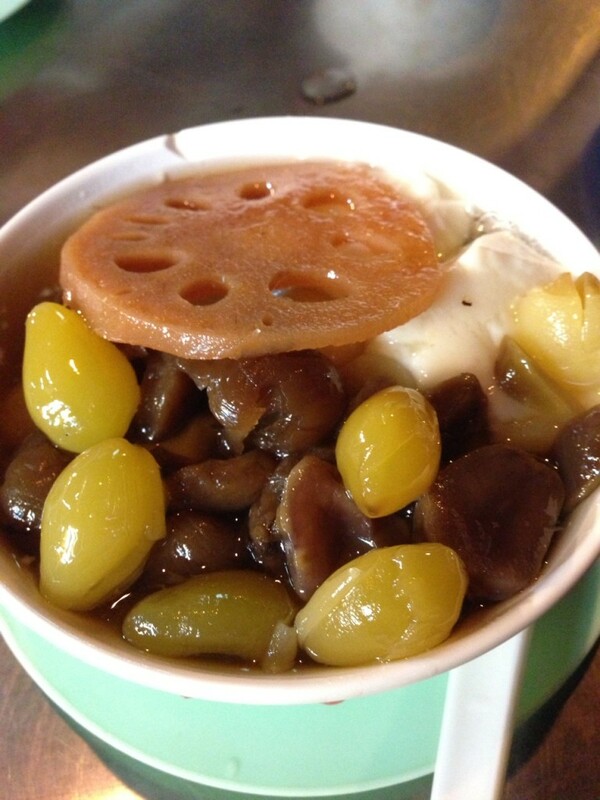 The dessert I would like to recommend you to try is a bowl of gingko nuts (แปะก๊วย), lotus root (รากบัว), longan and other goodies. There are many dessert stalls offering this dish, you can just randomly pick one place and enjoy! 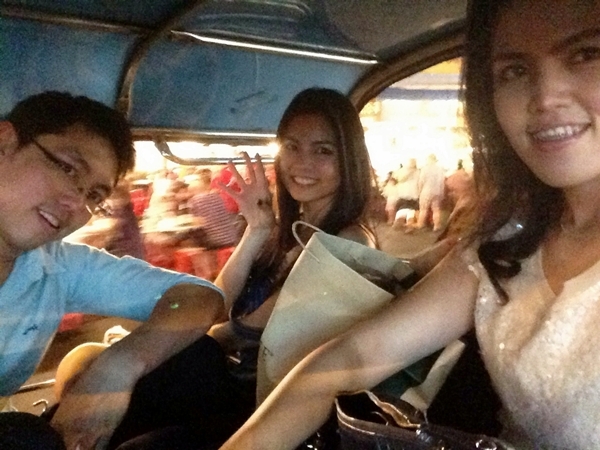 in a Tuk-Tuk with my sister and brother. 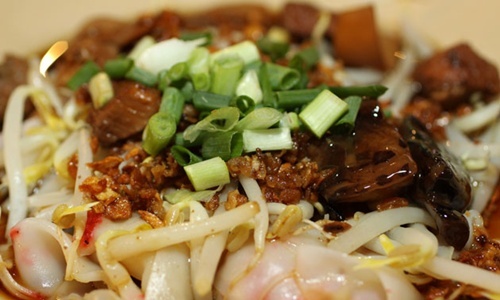 Have you tried any of these dishes before? Realmen eat hoi. Hoi aroy…. Great Post. Never been a big Hoi fan but that Peanut Nam Jim sounds perfect. Had the Hoi Tod at Lek and Rut Seafood the other night… so so. Yaowarat is one place I find hard to pick the right food. So many conflicting favourites.